Updated Thursday April 26, 2018 by West Bend Little League. Click on the link below (bottom of section) to take you to SignUp.com (the leading online signup and reminder tool) to the sign in page for West Bend Little League Concession sign up! You will then be allowed access to the sign up calendar. Find days that will work for you and choose a shift! We urge you all to consider doing a shift on Father's Day weekend. We host a HUGE tournament and is by far the day where we need the most volunteers to help throughout the city to host teams from out of town. The season starts 4/26, so please sign up! 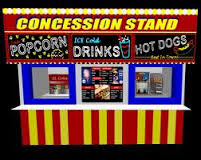 You do not have to do your concession stand solely for your division - you can do it anywhere there is a concession need. If you bought out for concessions, then this does not apply to you. For each child you have in the league you are required to do 2 shifts of approximately 2 1/2 to 3 hours. Time goes quickly and is alot of fun getting to know the families. Head coaches are exempt from concessions, not the assistants. Any questions, please contact Tammy Homuth at surebakesalot@att.net or 306-9664. Please sign up for West Bend Little League concessions 2017!